On April 9th, after enjoying a few hours in the adobe dunes just north of Montrose, Colorado, I took a side trip. Kinikin Road connects US Hwy 50, east of Montrose and just east of the entrance to the Black Canyon of the Gunnison National Park. I found Kinikin a few months before when I picked up a lamb that had been processed by Kinikin Processing. It had some interesting side roads to explore that I couldn’t check out at the time, so I checked them out on this trip. Below is the small version of the GPS track. Click on the image to see the bigger version. Kinnikin Road. Click on image for a larger view. Sorry that Kinikin is misspelled. 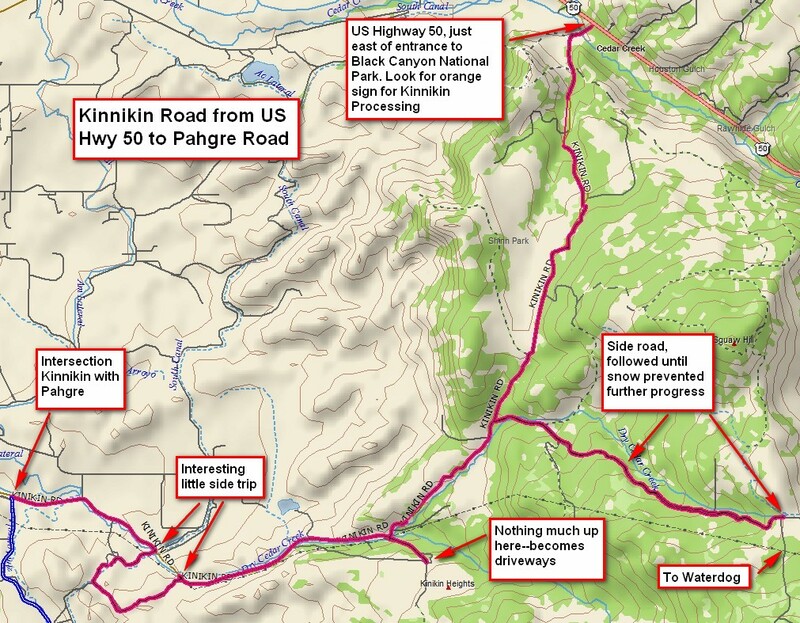 I started at the north end, where Kinikin intersects US Hwy 50. Kinikin is a well-maintained graveled county road. It winds through the back hills east of Montrose. What I was interested in was a side road that went east. You can see this road on the track. I followed it up to where I could go no further. It was full of nasty ruts and toward the top was rather muddy. The road became impassible at an intersection right up on the top of the hill. The road had not been cleared of snow past that point. It looks as though the road continues over the hill and connects with some gravel roads near Cerro Summit—I’ll have to check them out later this season. The intersecting road looked like it heads up an easy slope to Waterdog, a local mountain peak that is the site of many radio towers. A shot taken looking west from near the top of the side road. You can see the snow still on the ground. That's the Uncompahgre Valley and Montrose in the distance. On the way out, looking for more interesting side roads, I found the loop you see on the track. It turned out to be a dry—but highly rutted—road that meandered pretty much nowhere. 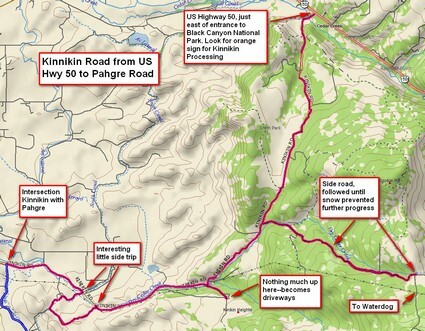 It teed into another road; I opted to head back toward Kinikin. I found myself on a rutted but quite passable road that served as one of the walls of a canal, filled with early spring runoff and flowing swiftly. From there I went down Kinikin toward Montrose until I came to Pahgre Road, a nice road that generally follows the Uncompahgre River. A very nice little side trip!